Couple of Sundays back, was weaving through the Suffolk countryside with me Ma en route to 221B in Sheeranville. Despite staring long and hard at that route, took a wrong turn and pulled over in Earl Soham close to their crinkle-crankle wall. More photos, inevitably, then eyed a "coffee shop" sign over the road. Ooh. You would, wouldn't you? BLTs, if you please, with your best smoked back. Certainly sir, he said. Take a seat outside and I'll bring them out. 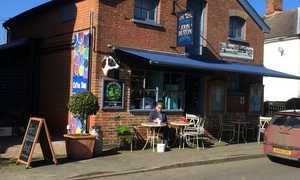 Marvellous to grab a pew in front of the shop opposite the bowls club, admire the passing traffic (more than you'd think) and soak up some spring rays, That is some quality pig meat, best I've had since Woodbridge's Wild Strawberry. Shop itself is, frankly, a thing of beauty. Presentation is ace with minted lamb, spatchcock chicken with lemon & ginger, and oh so many cheeses, plus all the king-of-the-deli names like Stokes, Leon's and Aspall. Plenty of passing trade while we finished our savouries and moved on to slices of fruit cake washed down with a fine cup of MorBeans coffee. Must make mention of the apples piled in bowls which act as centrepieces for the tables. Most original. Must we really go back to work? If it was a car -- Bristol V8 Bullet. If they were passing by -- Craig Gazey.